Yoga – As Manly As It Gets: Why men should do yoga! No! Yoga is not just for women, a man can do it too! Here are the reasons why you should put Yoga into your wellness routine! We as a society are collectively held back by gender-biases pertaining to a number of situations. One such thing and unfortunately so, is the practice of Yoga. While armies of ladies file into yoga classes sporting galaxy printed yoga pants and even more colourful mats, men keep away. Even though regular practice of yoga has proven to have several health benefits for men, it is a mammoth task to get them sign up for a class. Today, we are going to bust the belief that Yoga only ever looks good on ladies. Many men shy away from yoga as they are looking out for some form of slightly rigourous exercise. As a way to bust the myth that yoga is anything but physically challenging, let us give you an example of a typical day in a yoga class. As everyone rolls out their mats and settles down into session, a slight ten minute warm-up is called for. Warm-up stretches are important to get the body ready and started on to a grueling hour ahead. Now, the class is calm, they’re breathing even and raring to go into Suryanamaskar. The Suryanamaskar is an important asana as it engages almost every part of the body in an exhaustive ten-rep cycle. Now, the class will take on the warrior pose. The Iconic warrior pose which goes by the name Veerbhadrasana is a physically challenging posture which engages the shoulders as well as the hips. Stand with your feet at a 4 feet distance and push your right foot 90 degrees. Keep both arms at shoulder level and parallel to the ground. Now bend forward with you right knee till it is parallel to your toe. Hold this position for 10 breaths or more and repeat on the other side. After the Veerbhadrasana, the class will break for one-minute and reassemble for the Chair pose also known as the Utkatasan. Standing in Tadasan, raise your arms perpendicular to the floor, parallel to each other. Bend your knees as if sinking into a chair and keep thighs as parallel as you can to the floor. Close to a gym squat, the Chair pose works the quads, ankles, glutes, core, and shoulders. After attacking large muscle groups, the class will now settle for breathing exercises that help restore focus, concentration, and mental stability. Pranayamas are a series of techniques which regulate breathing and bring in a sense of comfort. It is like opening the chest into an altogether new inhalation and exhalation regime. In conclusion, the class will lie down in Shavasana to cool off and let the heart rate slowly come to its regular pace. Just like a typical day at the gym, an hour of yoga works on different muscle groups and strengthens the core like no other fitness routine can. There is nothing feminine about Yoga (if you don’t count the many colored Yoga outfits) just like there is nothing purely manly about going to the Gym or indulging in endurance sports. If anything, Yoga requires more stability, flexibility, and muscle strength than most forms of exercise. While it may not completely look like a testosterone-fuelled activity, it demands no less from the body. So, there you go. If the fact that Yoga seemed like a ‘ladies only’ activity held you back from joining all this long, you have one excuse less starting today. Want to try out Yoga? 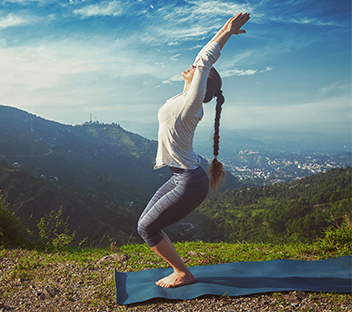 Explore all the different forms of Yoga along with with an exclusive VIP access pass and get a Being Yogi kit. Customize your own yoga routine with Yoga Focus. Know more!